When you first start to learn about scrap metal recycling in Southeastern Massachusetts, it can be kind of overwhelming – sort of, information overload. However, once you begin to learn the basics and start to develop a routine of your own, collecting scrap metal isn’t just an exciting challenge, but a profitable side or full time business. For those who are serious about learning how to earn cash recycling in Massachusetts, it is important to think about how and where you are going to break down the items that you collect and prepare them to take them to your local recycling facility to sell. In order to get the best prices for scrap metal, you will need to be able to identify the different types of metal and know which types are worth more than others. Once you figure out the ins and outs of sorting and collecting scrap metal, you’ll be on your way to becoming a professional scrapper in no time. This article features some tips gathered from some of the most successful and profitable scrappers across the United States. Some of these ideas may seem pretty basic, but they have helped these folks to make a living out of metal recycling in Southeastern Massachusetts and in other regions throughout the country. The first thing you are going to need as you begin to grow your scrap metal recycling business is a place to store your haul. Why would you store it? Some days are better than other days and you might not want to take the trip out to Mid City Scrap in Westport to sell your collection every single day. In fact, there are some benefits to taking your time, sorting out your haul, separating the different types of metal and studying the current payout rates in the area to make sure you are getting the best prices for scrap metal available. Giant Rubbermaid trash cans are a great way to start. They are cheap, durable and long-lasting. You can even put the lids on them to keep insects and other critters from getting into your collection. This is helpful, especially if there might be trash residue on some of your parts that you haven’t had a chance to clean off yet. You don’t want to end up with a bug problem in your garage, shed or wherever you are keeping your scrap metal. Just use a great big permanent marker to label the bins, according to the way that you are going to sort them to earn cash recycling in Massachusetts. Start out with the basics – ferrous and non-ferrous metals. Ferrous metals are any type of metal that contains iron. They are the most easy to identify using just a magnet. Non-ferrous metals do not contain iron, are not attracted to a magnet and are usually worth more money per pound than ferrous metals. While you will want to break things down by grade and type later as you get more into the business, in the beginning two bins for ferrous and non-ferrous metals should suffice. As you add more bins, just keep the ferrous and non-ferrous labels, but add copper, steel or aluminum underneath, to identify the specific type of metal to be stored. The next thing you need is a place to work on your haul after you spend the day collecting scrap metal. This is especially true for scrappers who take in appliances and separate the ferrous and non-ferrous metals in order to get the best prices for scrap metal. You can earn cash recycling in Massachusetts for some of the inner parts of appliances, such as the highly prized copper wires or pipes inside air-conditioners and some laundry machines. Your workshop should be indoors – either in a garage, shed, basement or some other area where you can have easy access to your truck to move things in and out without a lot of wasted energy. 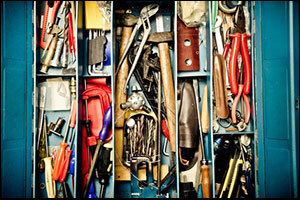 You will also want to have a work bench, a place to keep your tools and a place to keep your storage bins for sorting. A nice chair or stool would also be a great addition, as you will sometimes spend hours in your workshop breaking down materials. Some people like to add a fan for summer and a space heater for winter so they won’t get frozen out while metal recycling in Southeastern Massachusetts where it can get a bit chilly, to say the least. Some scrappers like to develop their own system and use other smaller bins, buckets or jars to store other items. Screws, nails, brackets, braces and other smaller items can be tossed into the general bin or kept aside for other purposes. It all depends on your methods and needs. There are tools that you use while you are out and about collecting scrap metal on your daily route, but there are other tools that you will want to have access to inside your workshop at home. Each scrapper has his own list of preferences, but the following list is a must-have of sorts that you will definitely need to be able to break down and get the best prices for scrap metal for your business. Tools that you will want to have while you are out-and-about collecting include: a magnet, a trailer and tie down straps for hauling over-sized items that won’t fit in your truck, bolt cutter, crowbar, screwdriver set, utility knife and anything else that will make your job easier. The point is to work smarter, not harder. As you are collecting scrap metal more, you will find things that will help you to earn cash recycling in Massachusetts that suit your own unique needs. There are lots of other tips that you will pick up by watching other scrappers, chatting at the recycling facility when you go to sell your materials or by just learning as you go. Scrap metal recycling in Southeastern Massachusetts can be quite profitable for those who are willing to work at it and learn. Bring your scrap metal to Mid City Scrap Iron & Salvage in Westport, Massachusetts. Get the best prices for scrap metal at our family owned and operated facility. Use our website to gather more information or give us a call at 774-319-5420 for current rates or directions.